April's designation as a month of rain is the anchor for this fifty-item brain teaser/vocabulary builder. 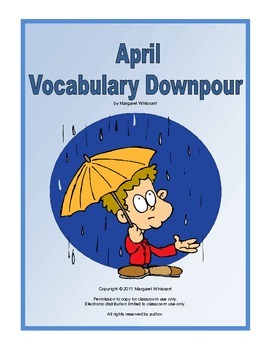 Students are challenged to identify words that have the actual letters r-a-i-n or letter combinations that sound like "rain" within their spellings. Also included are interpretive questions based on idiomatic expressions with the word rain. Five total pages including full answer keys. Download and enjoy.